Manhattan Project Sites Part Of Proposed Park Congress is considering whether to turn three top-secret sites involved with creating the atomic bomb into one of the country's most unusual national parks. Critics question the need for a park that celebrates nuclear weapons. Supporters say the park would ask tough questions about lessons learned. 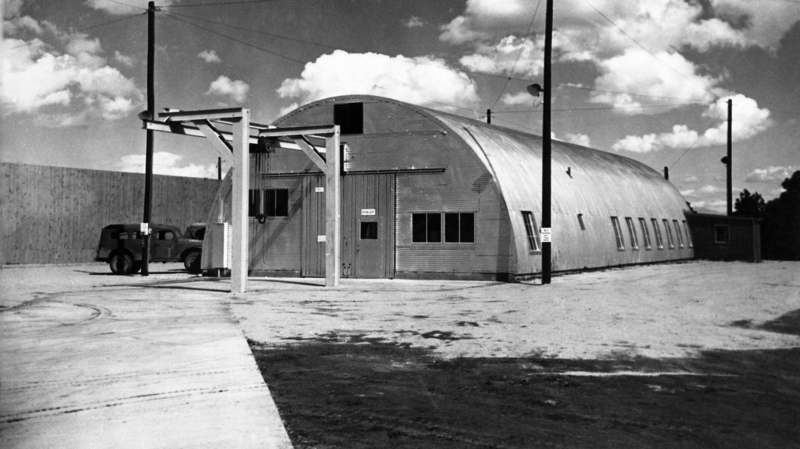 A Quonset hut on the grounds of the Los Alamos National Lab in New Mexico where "Fat Man" was assembled in World War II. Fat Man was the nickname given to the atomic bomb dropped on Nagasaki, Japan, on Aug. 9, 1945. The hut would be part of a new Manhattan Project National Park. Congress is considering whether to turn three top-secret sites involved with creating the atomic bomb into one of the country's most unusual national parks. The Manhattan Project — the U.S. program to design and build the first atomic bomb during World War II — largely took place at three sites: Los Alamos, N.M.; Oak Ridge, Tenn.; and Hanford, Wash. On July 16, 1945, the first test of an atomic bomb took place at a site in the southern New Mexico desert. Hiroshima and then Nagasaki, Japan, were bombed less than a month after the test. In 1942, the Army had taken over a boys school in the forests of northern New Mexico. Dozens of the world's most brilliant scientists, led by physicist Robert Oppenheimer, came to Los Alamos to design the weapon. Over the decades, though, the Manhattan Project buildings deteriorated. 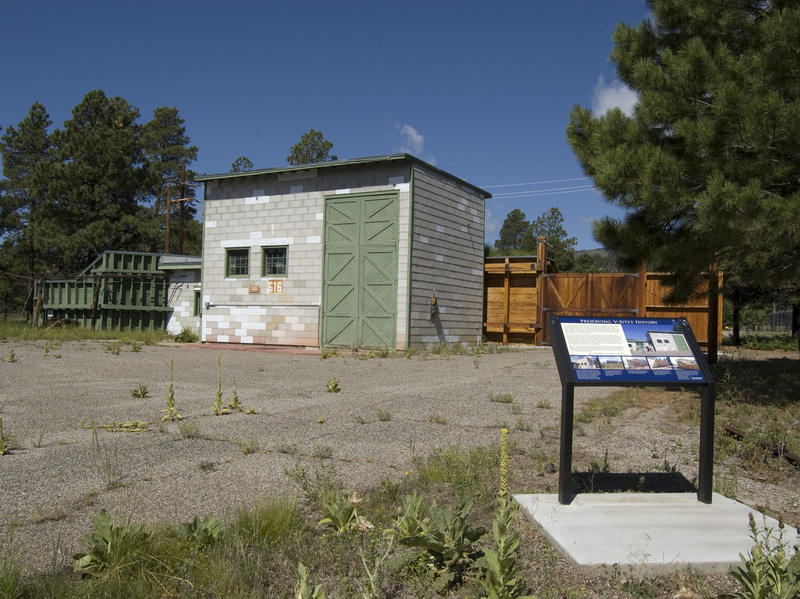 The restored building where the "Gadget" atomic bomb was assembled would be included in the Manhattan Project National Park. Gadget was the nickname given to the first nuclear bomb, tested at Trinity Site, N.M., in July 1945. Ellen McGehee is the Los Alamos National Laboratory's official historian. She opens the door into a dark concrete bunker. The walls are still painted the light green anyone who went to school or worked in a government building back then would recognize. "This main room here is where they did the assembly work for the 'Little Boy' weapon," she says. Little Boy was the nickname given to the bomb dropped on Hiroshima. Construction crews at Los Alamos National Laboratory are already doing historic restoration. And McGehee is delighted to show off the restricted sites, though it's not likely the public will get this kind of access. That's because scientists are still doing all kinds of weapons research at the Los Alamos labs. Instead, the Park Service would build a visitor center in the nearby town of Los Alamos. There are already a science museum and a historical museum there — though they mostly chronicle the science of nuclear weapons and downplay the ethics of them. The lab might also conduct tours several times a year or move fencing so the historic sites are outside the restricted area. A bill to create the Manhattan Project National Park was defeated in the House in September. "We're talking about the devastation of the people of Hiroshima and Nagasaki — hundreds of thousands killed, $10 trillion Cold War between the U.S. and Russia, tens of thousands of nuclear weapons which today threaten the existence of the world — and this is something we should celebrate?" asks Rep. Dennis Kucinich (D-Ohio), one of the bill's critics. Supporters in Congress have said they'll try again, possibly before the end of this year. A park would be a commemoration, not a celebration, says Heather McClenahan, director of the Los Alamos Historical Society. She points out there are national parks commemorating slavery, Civil War battles and American Indian massacres. "It's a chance to say, 'Why did we do this? What were the good things that happened? What were the bad? How do we learn lessons from the past? How do we not ever have to use an atomic bomb in warfare again?' " McClenahan says. Tough questions to ask in a place where scientists are doing ongoing weapons research — but maybe necessary questions if Los Alamos and the other Manhattan Project sites are going to become national parks.